Easy going, smart, energetic 19 weeks old Joli is a cuddle bug ready to romp at the drop of a hat and yet easily settles in for a quiet time. Joli will be attending our adoption event on Sunday, November 11th. Time and place details are at www.ShepHeroes.org/events. Joli is crate and potty trained with excellent recall as she loves her people. She is being fostered with Jett, they play non-stop throughout the day and sleep crated next to each other at nights. They are under the watchful eye of 3 resident shepherds who have shown them proper etiquette and manners in all things dog. She prefers to watch and defers to her humans when the other shepherds alert to strangers at the door. She loves to offer shakes when she thinks it might charm you into giving her treats. Although she preferred female humans when she arrived at ShepHeroes, she equally loves all humans now. If she's not playing chase or rolling around with Jett or the older shepherds, she entertains herself with toys. Joli has attended a couple of outreach events for socialization giving and receiving lots of love. She meets people and dogs easily. She is excellent in car rides short and long, outgrowing her original car sickness. She loves swimming and must be supervised around pools. Although she is cat compatible with the very dog savvy resident cat in her foster home, she is aware of squirrels in the trees and gives chase. 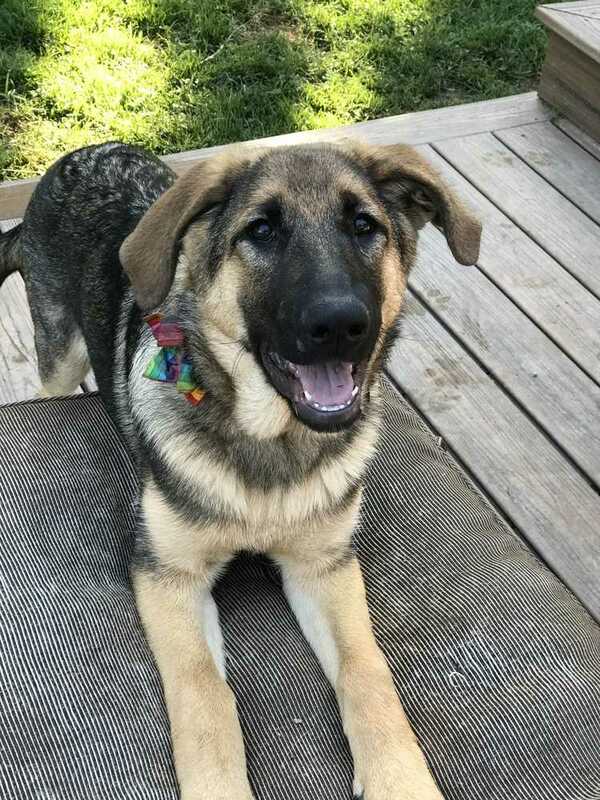 Big boned and stocky at 42 pounds, Joli will be a large adult shepherd and adopters interested in Joli must have large breed puppy experience and commit to regular exercise, socialization, and training for Joli to become an amazing adult dog. Level 4 - Standard GSD Puppy/Experienced Ownership Required. Puppy or moderate to very high energy adult dog. This level adult dog is not an average pet as it needs working breed experienced owners to provide leadership and management.